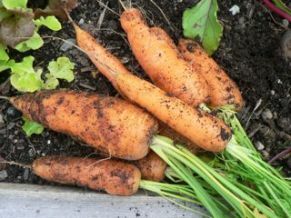 Growing Carrots - Everything you need to know. Carrots are one of the most popular vegetables to grow and eat. Biting into a fresh picked baby carrot is a marvellous way to take a break from vegetable gardening. Thin by pulling and eating the baby vegetable making room for the rest to grow larger. They can be harvested as soon as they are finger size and continue to grow for 2-4 more months. Here are some free vegetable gardening tips I have put together to help you grow your own. Location - Open, sunny, well drained. Soil - A well prepared, fertile loam, preferably rich and sandy with 6.5 pH. This vegetable will succeed in almost any reasonable good garden soil. However, it should be well dug and pulverized and free of stones. Too much nitrogen makes them taste awful and become hairy and misshapen. Soil Preparation - Grows well after a legume green manure. Dig in 2 inches of compost or aged manure. Planting times - Sow direct April – mid July, do succession planting. Planting Instruction - Use hand seeder for planting. When 2 inches high thin to 2 inches apart. Mulch in warm weather; best tasting when grown in cool weather. Watering - Water regularly, preferably with drip irrigation. Disease & Insects - Carrot fly (use remay; make sure it is secure to the ground using wood or rocks). Overhead watering attracts the fly. Harvest - For baby vegetables pull the whole plant when they are 3/4 inch thick. Larger ones can be harvested at any time. Wash the dirt off by immersing in a bucket filled with water. Storage - Remove tops before storing. Refrigerate or store in a cool place in a perforated bag or containers to allow for air circulation. Will keep for several weeks. In a medium saucepan boil vegetable until tender-crisp; drain and put back into the heated saucepan. Add honey, orange juice, butter, ginger and zest. Quickly stir for 2 -3 minutes or until glaze forms. Makes 4 servings.